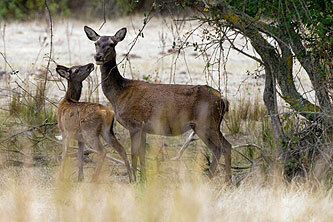 This is the official web site of the LIFE+ project called "One deer, two Islands: conservation of Red Deer Cervus elaphus corsicanus in Sardinia and Corse" (founded by LIFE+ Nature and coded LIFE11 NAT/IT/00210). This project deals with a partnership between Sardinia and Corsica realized by this governative agencies: Provincia del Medio Campidano (leader) - Ente Foreste della Sardegna - Parco Regionale della Corsica - Provincia Ogliastra - I.S.P.R.A. Actions are scheduled through five-year (2012- 2018) and aim to improve the conservation status of endemic Red Deer (Cervus elaphus corsicanus).